Renault Key Card Repair & Replacement - Get a Free Quote! Getting a programmed key card or having your faulty card programmed is very easy. We are licensed, bonded as well as insured. We have a 24×7 customer service which will enable you to contact our locksmiths in the event of any mishap at any time during day or night. 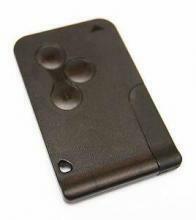 Renault Laguna Key Card; is a triple button card with no company logo and you can have replaced at your closest dealer. Their size and weight is highly reduced; most Renault key cards have been heavily minimized. Their surfaces are smoothened to increase their compatibility with the hand and give you the comfort of walking with your keys anywhere. They are made from strong materials that can contain impacts as well as extreme heat. Most of these key cards use remote control to activate various systems in the car without any physical contact. They have multipurpose buttons that allow auto-lock and unlocking a door or even all car doors at a go. They also have a button that can be used to trigger horn and light during emergencies or in case you want to attract some attention. They also trigger or deactivate car alarm systems. The programmable car keys allow car owners to set limits on speed, audio systems’ volume and other measures that can boost driver’s safety especially when giving out your car. With Renault key cards therefore, your car keys have control over almost every aspect of the car.